With this Princess Style Kids Sofa your children will now be able to enjoy the comfort that adults experience with a comfortable recliner that was made just for them.This chair features a strong wood frame with soft foam for your active child. Choose from an array of colors that will best suit your child's personality or bedroom. This petite sized features storage arms so kids can store it away and retrieve at their convenience. Cute & Durable - Perfectly sized sofa for girls that gives them a spot they can call their own while reading, eating snacks, watching TV. Constructed by wood frame and filled with soft sponge, Costzon kids couch sofa features solidity and durability. Velvet Touch - Every girls dream of having a lovely couch! Super soft velvet will give them a great touch. Lightweight Design - Lightweight design for easy movement. Your baby can move their own furniture to any ideal place without much efforts, which cultivates their manipulative ability. It is also convenient to carry. Supported by the height of 2" feet which adds extra stability. 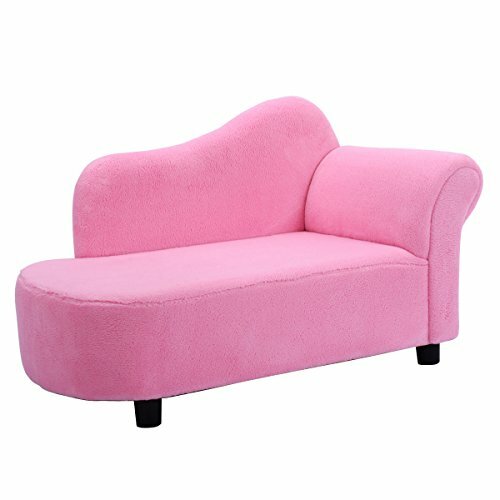 GREAT GIFT - This adorable sofa is a PERFECT present to your girls. It will be a great addition to their play room, bedroom, living room, day care, sleepovers at grandma and grandpa's, vacations, or nap time.